So, I’ve been told I’m a pretty handy guy – and I must admit that fixing, building, demolishing, improving, cleaning, refurbishing and trouble-shooting are all things that make me happy. Give me an afternoon off – and I’ll go tinker with my motorcycle, or wash the cars, clean out a closet, or hang that book shelf. I love to tinker with stuff … but I’m also very practical. I try not to have two of anything – either the first thing is good and does the job, or you better have a very good reason for replacing it. I just replaced the belt on my vacuum cleaner for the second time. It’s an 89 dollar Hoover Elite I bought in california in 1994 – you know, the kind with the bag? It works great, so $2.29 for a new belt, $3.29 for a new light bulb and viola – good as new!! So when it comes to technology I don’t just buy stuff because it’s cool, it must have a purpose. I upgrade the home network to make things run faster, we buy more backup disks because we need more space (or you accidentally delete a bunch of your wife’s stuff, but that’s another story) … it has to be put to use and have a purpose. Well, I bought Crystal an iPad 2 for her birthday and i have to say – it’s pretty cool!! But I’m not quite sure what it’s purpose is yet? It has spawned a whole new set of functional, home-based IT projects for me, so that makes me happy. The kids have also fallen in love with it – like a new puppy you bring home from the pet shop. Which brings us to a scary chapter in parenting – how do you introduce a child to technology without it becoming too important in their life? I have nightmares of my son becoming some “world of warcraft” junkie – eating twinkies and gulping 2-liters of JOLT in our basement. Or my daughter thumping away on her cell phone at the dinner table, texting her girl-friends – or guy-friends? – gasp!!. My disposition of being a practical person (everything must have a purpose) will surely rub off on my children, right? They won’t use these practical technology devices to dissolve into this world of virtual reality we call the internet – will they? Not if I have something to do with it. For now we will have FUN with our new widget – explore, create, learn, laugh, read, listen and watch what we can do and its purpose will surely come to light. 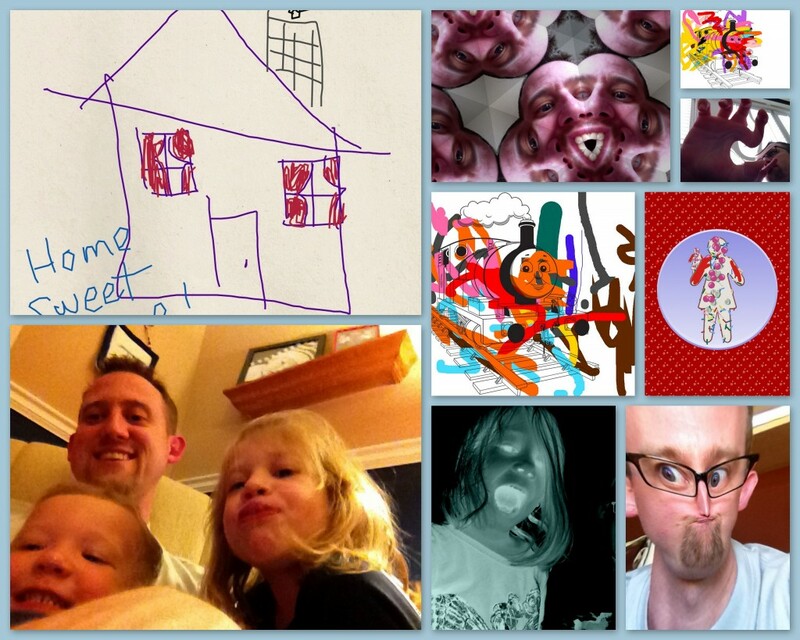 Here’s a collage I built with some funny stuff we did this week on our new iPad.